As I mentioned in a previous post, I am taking a course at Second City. I took the class in order to see if I could do it, to have some fun and to meet some new people. I have accomplished all of the above. One of the great people I was able to meet was a young lady named Liz. She writes for a Chicago-based resturant magazine. She let us know that she is a food critic for them. It was when I heard this that I asked her if she rated just food that had French names or real food as well. Liz informed me that she does rate regular stuff, too. I let her know that I recomend a hot dog place in Downers Grove, IL that I have been going to for the past dozen years. 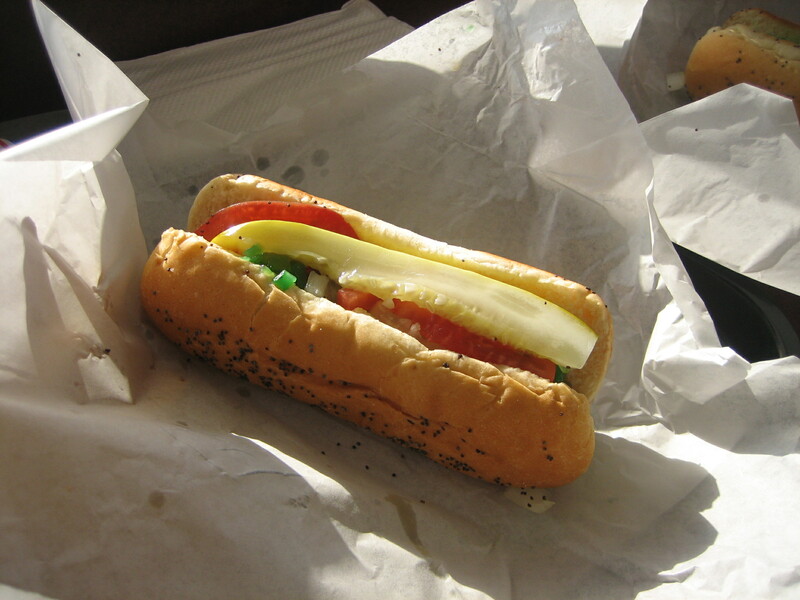 She challened my tastes by tossing out some of the more well-known hot dog locations around the city of Chicago. I felt confident that this was within the same arena. Liz agreed to venture out of the city to my neck of the woods for a hot dog. I talked up the steamed dogs and buns. I raved about how great the fries are (crispy on the outside and warm and mushy on the inside). She still seemed to have her doubts on whether or not her trip was worth it. She even told me that she felt she had ventured past "BUFU." It is not like we were surrounded by corn fields and manure. It must have been the free parking that threw her. So, the lovely Liz approached the entrance and mentioned she enjoyed the "No bare feet" sign on the door. (Ok, chalk ONE element up to her BUFU theory.) 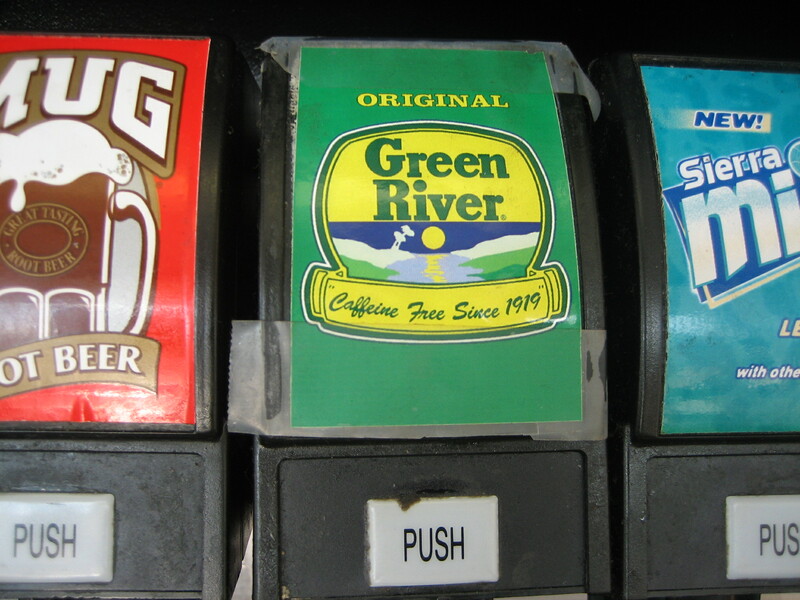 As soon as she entered, I pointed out the "Green River" on tap at the soda fountain. She felt that this was worthy of a picture. Yup. She took photos for her food blog. She even took photos of the dog/bun steamer that I pointed out next. We ordered the daily special, (two dogs and a small fry) which I think is always the daily special, and got a spot at the bar around the windows. After photographing the hot dog (She pretty much took a picture of everything) she gave it a shot. While she didn't seem overly impressed, she was not upset either. Liz did, however, adjust the dog negativly by placing ketchup on it. That could have a big factor in her lower-than-expected rating. It was as we were discussing our Second City class that a fellow customer over-heard us. 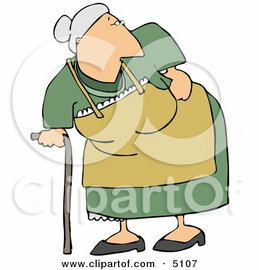 She was a rather large older lady with yellowed teeth. (Ok, TWO elements) She asked us where we went to school. We let her know that it wasn't an actual school class, but instead classes for fun at Second City. This lady's life story was offered next. Because, as all of us know, discussion of improv training prompts a Biography Channel-like synopsis of the listener. We learned that the doctor who told her that she wouldn't live past eight died eight years ago, she was paralized, but now drives stick shift, she is back in school and she draws pictures of your pets for $80 for an 8 X 10. Don't get me wrong, she was nice, but fell into that category of persons who annoyingly offer more information than desired. Should anyone want their pet drawn, she does it by photo or by visiting the animal, I can get you her contact info and I must say that her buisness card did have a very well drawn dog on the card. Once we were informed of the dog artist's life-long path to the hot dog place, we went outside. There we talked a little more about our improv class and decided to head our seperate ways. I was off to finish unpacking the rest of my appartment and she, off to write for her magazine. If you would like to see her thoughts on the day, click here. More on what you missed in the past month and a half coming up soon! It wasn't the free parking that threw me, rather it was the strangely claustrophobic feeling of being completely surrounded by strip malls of the same beige hue. Don't get me wrong, I liked the CC, but it was a schlep and a half to get there. I did like the Green River, even though I just realized the label is Scotch taped onto the tap. I didn't mention the lady because the ordeal was too hard to explain, but nice job John MC. Now add me to your blogroll.